Rocker Jon Bon Jovi is giving back in a big way with a new passion project benefiting The Jon Bon Jovi Soul Foundation. 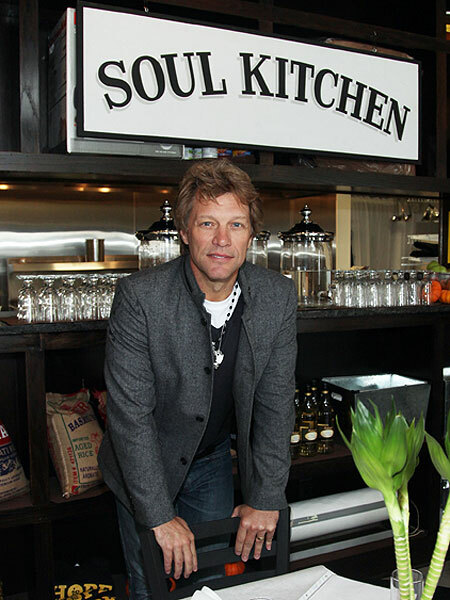 The singer's new restaurant, The Soul Kitchen, aims to feed and empower those who are less fortunate. Jovi explains, "People are going to bed hungry. This is New Jersey in America... that shouldn't be happening." The philanthropist gave an inside tour of the new eatery to "Extra's" AJ Calloway, and explained, "We developed this system where there are no prices on our menus. There's a minimum suggested donation, and then anything above that covers the guy's meal next to you." The Soul Kitchen is not a soup kitchen, but a place for people in need of a meal to volunteer in lieu of payment. "[This is] what they can do in order to come into the restaurant... is volunteer." Bon Jovi is not only heads the foundation -- he also offers up his time and hard work at the restaurant, located in Red Bank, NJ. "I'm really good at washing dishes. That's my job. I don't cook... you don't want to eat my food. But your dishes, I guarantee you, are clean!" Calloway insisted on teaching Jon how to cook. Bon Jovi came back with, "Can you be a celebrity chef and come in here and volunteer?" AJ replied, "Oh, man, I would love to!" The New Jersey native reminded AJ of the promise, saying, "Got that on camera!" To find out how you can help Bon Jovi's delicious cause, click here.